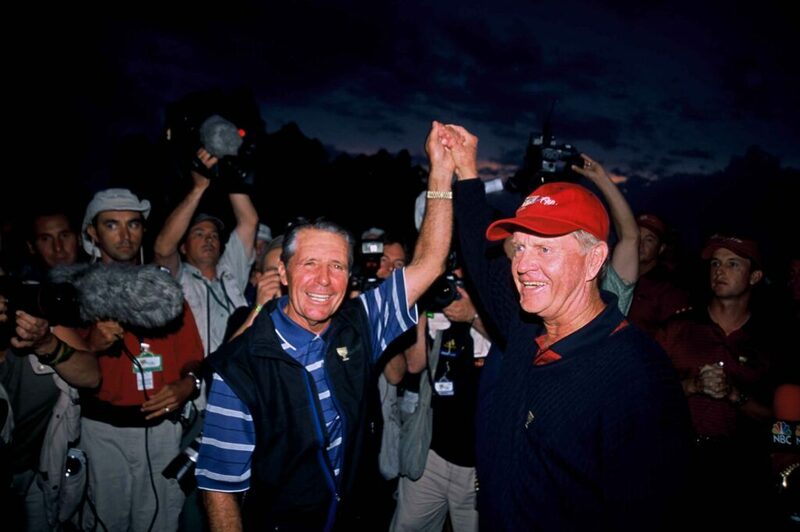 The 2003 Presidents Cup with Jack Nicklaus and Gary Player as captains ended in a memorable tie when they agreed the two teams would share the Cup. This year, Nicklaus and Player are honorary captains of the first Junior Presidents Cup. Beginning with this week’s Presidents Cup at Liberty National Golf Club, the PGA TOUR is starting a new chapter in Presidents Cup history by partnering with the American Junior Golf Association (AJGA) to conduct the Junior Presidents Cup, featuring 24 of the best junior boys 19 years old or younger from the United States and around the world, excluding Europe. The first-ever precursor to the Presidents Cup is being held at Plainfield Country Club in Edison, N.J., with honorary captains Jack Nicklaus and Gary Player. Nicklaus and Player will be present this week to instill added inspiration and pride among their respective teams and further ensure an unforgettable experience for each junior participant. The two World Golf Hall of Fame members combine for seven total Presidents Cup captaincies, including the three where they captained against one another: 2003 (which ended in a memorable tie when the captains agreed the two teams would share the Cup), 2005, and 2007. Prior to his four stints as the U.S. Presidents Cup Team Captain along with two as the U.S. Ryder Cup Team Captain, Nicklaus competed on six U.S. Ryder Cup Teams (1969, 1971, 1973, 1975, 1977, 1981) and played in seven editions of the World Cup (1963–1967, 1971, 1973), winning the team portion of the competition six times. Nicklaus has also designed two golf courses that have hosted the Presidents Cup—the 2013 Presidents Cup at Muirfield Village Golf Club and the 2015 Presidents Cup at Jack Nicklaus Golf Club Korea, which represented the first-ever playing of the prestigious international competition in Asia. The U.S. Team for which Jack Nicklaus is serving as Honorary Captain is made up of team members Garrett Barber (Stuart, Fla.), Akshay Bhatia (Wake Forest, N.C.), Jacob Bridgeman (Inman, S.C.), Prescott Butler (Old Westbury, N.Y.), Canon Claycomb (Bowling Green, Ky.), Noah Goodwin (Corinth, Texas), Cole Hammer (Houston, Texas), Joe Highsmith (Lakewood, Wash.), Eugene Hong (Orlando, Fla.), Turner Hosch (Dallas, Texas), William Mouw (Chino, Calif.), and Trent Phillips (Inman, S.C.). U.S. Team qualification was determined by the Rolex AJGA Rankings. “What an honor and delight it was for me to be asked by then PGA TOUR Commissioner Tim Finchem to be Honorary Captain for the first International Team of the 2017 Junior Presidents Cup,” Player said. “Not only does it give me the opportunity to reunite with my one-time rival, close friend and Honorary Captain of the U.S. Team, Jack Nicklaus, but it opens the world to new possibilities for the younger generation of top junior golfers of which I am excited to be a part of. The International Team is made up of team members Josh Armstrong (Australia), Luca Filippi (South Africa), Garrick Higgo (South Africa), Christo Lamprecht (South Africa), Fred Lee (Australia), Sean Maruyama (Japan), Naraajie Emerald Ramadhan (Indonesia), Jayden Schaper (South Africa), Rayhan Thomas (India), Karl Vilips (Australia), Atiruj Winaicharoenchai (Thailand), and Wocheng (Aden) Ye (China). International Team selection was based on the World Amateur Golf Rankings (WAGR). Both Honorary Captains are supported by a captain for the Junior Presidents Cup, who are handling the primary duties during the competition, including creating the daily pairings and conducting the draw of the matches. The U.S. Team is captained by David Toms, while the International Team is being led by Trevor Immelman. Following the conclusion of the Junior Presidents Cup, the teams will be invited to witness the Presidents Cup at Liberty National firsthand—a prelude to potential future Presidents Cup participation for those who move on to play the game professionally. To learn more about the Junior Presidents Cup and for live scoring, visit ajga.org.